UV treatment is one of several technologies the Environmental Protection Agency will recommend to help communities meet new, more stringent drinking-water standards due out in 2002. UV light is not only effective, but also very efficient. It can disinfect water at about one-tenth the cost of other treatment methods ... in part because the equipment is so small. American Air & Water offers UV water disinfection systems for a variety of water purification applications. Water is being used for practically everything therefore ultraviolet water purification can be applied to a vast number of diverse applications. Water treatment professionals have used ultraviolet water disinfection for over 60 years and the technology is steadily advancing. UV water purification systems are also used for sterilizing water in air-conditioning systems and preventing infection due to microorganisms in air humidifying systems. UV is used for control of Legionella with applications in hospitals, office buildings and large residential buildings. The treatment of swimming pool water by means of UV light effectively reduces the level of chloramines in the pool. Reducing the level of chloramines in the water, as well as in the air, greatly improves the environment for those swimming... While ultraviolet light has the added benefit of accomplishing disinfection in swimming pools and water parks, it should not be considered a replacement for chlorination or other types of chemical treatment. A properly sized UV system successfully controls chloramines; increases comfort and health for swimmers and staff; eliminates the need for dilution and super chlorination; reduces corrosion and, most importantly, protects against Cryptosporidium and Giardia. Water disinfection is one of the key treatment steps for all types of swimming pools, either public or private. Efficient pool water disinfection is essential for public pools. In order to ensure safe bathing water, most public facilities must follow strict water disinfection standards and practices. Chlorine is still the water disinfectant of choice for most public pool operators. However, there is a growing awareness of the negative effects caused by chlorine and its by-products. Chlorine not only reacts with the microorganisms in the water, but also with any type of organic material, thus forming problem by-products like Trihalomethanes and chloramines. Trihalomethanes (THMs) - Within this group mainly chloroform is formed by the reaction between the disinfectant and organic compounds. THMs can be found in the pool water and in the air above the water. Swimmers are therefore exposed by absorption through the skin, by swallowing, and by inhalation. THMs are suspected to be carcinogenic and asthma causing, as stated by researchers from Belgium (BBC News, May 28, 2003). Chloramines - Chloramines appear in swimming pools as a result of the reaction between ammonia compounds and chlorine-based disinfectants. Depending on the stage of chemical reaction, they can be in the form of mono-chloramines, di-chloramines, or tri-chloramines. Chloramines are responsible for the so-called "chlorine smell", eye and skin irritations. High levels of chloramines also cause corrosion issues inside the pool enclosure. Ultraviolet treatment of pool water photo-oxidizes and destroys combined chlorine and other pollutants, giving major improvements to pool environment and water quality, with significantly lower levels of chlorine. UV also provides non-chemical disinfection, giving effective primary control over waterborne bacteria, benefiting commercial and municipal pools. Spa and hot tub establishments present difficult disinfection problems due to the high bather load and temperature. American Air & Water provides fitting UV water purifiers for spas and hot tubs, including large UV units. The spa and hot tub UV water purification systems bring a dramatic improvement in water quality. Until recently public pool operators have had little choice but to use chlorine disinfection systems, sometimes together with an ozone oxidation process. The UV water purification systems have proved that ultraviolet treatment with low levels of free chlorine has major benefits over any of these traditional methods. The greatest benefit of UV treatment is that short-wave ultraviolet light has a photo-oxidation effect that destroys chloramines and other toxic by-products of chlorine. This is done without adding any further chemicals to the water. Much less chlorine needs to be used to provide bacterial control, so water quality and atmospheric conditions are considerably improved. The primary UV disinfection process destroys all bacteria passing through the water treatment plant. In particular, and unlike ozone systems, this protects bathers against bacteria in the water filter media re-entering the pool. UV destroys these pollutants releasing free chlorine back to pool. UV acts instantly. Only low level chlorine residuals are necessary. UV cuts costs by releasing the combined chlorine. Chlorine produces toxic by-products, which build up in water and atmosphere. Chlorine is a slow acting disinfectant, unless concentrations are high. Excessive chlorine is needed to overcome high organic loadings. UV plant is simple, and lower in capital cost. It performs the same oxidation & disinfection tasks at a fraction of ozone’s running cost. Maintenance costs of UV equipment are lower, and do not increase significantly with age. With UV plant simpler filter media can be used, saving carbon and chlorine costs. It is impossible to overdose UV light. UV treatment replaces ozone, and does not use or create any toxic chemicals whatsoever. Ozone plant is relatively complex and costly and so is expensive to run, even when new. Ozone plant becomes increasingly difficult and expensive to maintain. To remove the toxic ozone before it enters the pool needs carbon filtration; this itself uses up free chlorine and increases the chemical costs. Overdosing, and ozone entering the pool itself, is possible if ozone equipment malfunctions. Ozone leak detection is difficult, giving rise to health & safety concerns (ozone is VERY toxic). Full flow treatment treats all the pool water flow, at every pass. No restriction to pool water flow. These hybrid units only treat a small portion of the pool flow, not recommended by the Pool Water Treatment Guide. Higher pump pressures required, possibly requiring an extra boost pump. Additionally, the combination of chlorine, chloramines and ozone in the indoor air can be very corrosive to equipment and buildings. UV water treatment replaces ozone and controls chloramines levels, so building maintenance expenditure is reduced. With these advantages there are no reasons for swimmers and staff to endure an unpleasant pool environment. UV water purification systems are successfully installed and are showing chlorine reduction rates of up to 90%, at the same time controlling free chlorine levels in water to less than 1.0 ppm. Water quality and atmospheric conditions are considerably improved, operating costs are cut and pool attendance and revenue is increased. UV water disinfection of private pools and spas is a chemical-free method of killing microorganisms by shortwave ultraviolet light. To ensure a safe and pleasant pool environment without using strong disinfection chemicals, ultraviolet water purification destroys organic pollutants instantly as the water passes through the treatment chamber. The ultraviolet sterilization systems for private pools are particularly suitable for users who are sensitive to the usual swimming pool disinfectants, heavy metals from ionic purifiers or allergic to chlorine. Contact American Air & Water for details of how we can help you to simplify pool maintenance, minimize chemical usage and save your money. The liquid sugar, which has very low transmission, passes as thin film over tightly packed UV disinfection lamps where it is exposed to powerful ultraviolet light and is disinfected. The germicidal ultraviolet lamps are oriented in tight clusters to maximizes UV exposure at very low UV transmittance (UVT) levels. The liquid sugar UV systems are specially designed to treat liquids in a thin film manner. This is where the lamps are spaced close together to optimize the disinfection process. They are designed to treat opaque and thick liquids, syrups with high osmotic pressure (brix 25-67), glucose, juices and other base materials. From small household disinfection systems to large municipal systems, American Air & Water offers a wide range of UV drinking water disinfection systems manufactured by WEDECO Ultraviolet Technologies. Drinking water disinfection is one of the most important segments for ultraviolet disinfection. In addition to centralized drinking water UV treatment plants, which are typically managed by local municipal agencies, decentralized drinking water disinfection plays an increasing role in regions which are difficult to access and where extensive water distribution networks are cost-prohibitive. Moreover, drinking water on ships and trains is also disinfected using ultraviolet light. Pharmaceutical water systems fall into two classifications defined as purified water and water for injection. While the water for injection system is more stringent and specific for design, operation, and maintenance, both must meet guidelines established by the United States Pharmacopoeia XXII monograph. For the medical device industry, purified water quality is normally required. Personal Care Product manufacturing uses similar pure water production practices to produce cosmetics, toiletries and other health and hygiene products. A wide variety of feed water is used to produce this high purity water. Possible water sources include surface, well, municipal potable water or a blend of these sources. The water purification system design as well as the equipment type and size is determined by the feed water quality. Water "contaminants" such as dissolved organic and inorganic compounds, suspended solid particulates and microorganisms must be removed in pure water treatment systems. 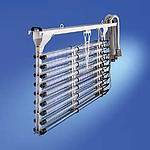 Ultraviolet light is used extensively in purified water and water for injection water systems to prevent microbiological contamination and growth. UV is also used for residual ozone destruction in pure water loops where ozone is employed as a "system sanitizer" to purify pipe and tank surfaces. An important area of use of ultraviolet technology is in the production of purified water for Semiconductors. Hydrocarbon compounds (TOC) in water can be reduced by a combination of using ultraviolet light with a 185 nm wavelength and other processes. This particularly high degree of purity is essential in the electronics industry and specifically manufacturing of semiconductors. Legionellosis, commonly referred to as Legionnaires' disease is a severe form of pneumonia caused by legionnella and can be lethal, particularly with the elderly and with people whose immune system is impaired. It is transmitted by inhaling the legionella existing in droplets of water. Legionella reproduce particularly well in the luke-warm water (30-45°C) of stale circulation pipes of hotels, public swimming pools, schools or residential buildings or in humidifiers of air-conditioners. If these water reserves are not used or exchanged on a daily basis this strongly encourages reproduction of the bacteria. When water is extracted, e.g. during a shower, use of a humidifier, the legionella reach the human respiratory tract via inhaled aerosols. In the lungs the bacteria then reproduce in the monocytes. However, acute disease only manifests if a larger number of pathogens is inhaled or if the host has an impaired immune system. There are no statutory limits for contamination with legionella, however, a load of 20 CFU/ml, i.e. 20 colony-forming units per milliliter is considered to be critical. From 100 CFU/ml, for example, public baths are closed down. With regard to the hygienically permitted dose, legionella are to a large extent also immune against chemical disinfectants, e.g. chlorine. A warm water UV disinfection system is installed directly behind the boiler which continuously disinfects the water in the circulation pipes, thus providing guaranteed protection from re-infestation with pathogens. UV reactors can be integrated in all water pipes and therefore represent effective protection against re-infestation of a system. Air-conditioners which work with spray evaporators to humidify the air also represent an excellent breeding ground for legionella. For these systems as well, physical UV disinfection of the stored water offers safe protection from re-infestation even outside of operating times. The popularity of aquariums and zoos has grown to an all time high over the last 20 years. But bringing aquatic life to a man-made environment has proven to be a difficult scientific task. Hundreds of theme parks and zoos throughout North America showcase whales, dolphins, seals and other mammals as well as practically every fish known to man-kind. To create habitats for these species, large fresh or salt-water ecosystems must be constructed. These "life support systems", comprised of millions of gallons of man-made "water", must be continuously treated and monitored to ensure the life, health and comfort of the sea creatures. The earth's ecosystem possesses its own cleansing cycle, maintaining a natural balance in which all creatures can live in their natural habitat. A man-made habitat is almost a closed ecosystem where the scale is tiny in comparison to the earth. As a result, the pollutant load associated with animal waste, food degradation, and natural contamination is relatively high. Therefore, the water must be continuously treated in order to eliminate organic pollutants as well as harmful bacteria, viruses, and other microorganisms. The water must also be monitored to ensure that the chemical balance, pH, and temperature levels remain stable and appropriate for the specific inhabitants of the ecosystem. The aquaculture and fish farming industry is very similar to the aquarium and zoo segment. Ultraviolet has two primary uses in the aquaculture industry: disinfection of water supplies and ozone destruction. UV Water Disinfection: Surface water used at fish culture facilities has certain risks of contamination from waterborne pathogens. In some instances, dramatic effects caused by newly introduced pathogens into the production water will cause complete shutdown of a facility, eradication of its stock, and/or contamination of the holding tanks. UV For Ozone Destruction: In addition to UV, ozone can be used for disinfection in fish culture facilities as well. When ozone is selected as the primary disinfection mechanism, an ultraviolet system should be used as a destruct device for residual ozone levels in the water. The UV system also provides back-up disinfection for the overall treatment process. Ultraviolet equipment provides an economical means of water disinfection for beverage and bottled water manufacturing facilities. There are three primary types of applications for UV systems. The first application provides disinfection from the feed water source to the storage tank. The water can be re-circulated from the storage tank back through the UV equipment in order to maintain bacteria reduction. The second application involves disinfection of the facilities bulk tanker water supplies. Water flows from the tanker through the ultraviolet unit prior to entering the storage tank. The third application is for ozone destruction as the water leaves the storage tank for the bottling lines. This method also provides the added benefit of secondary water disinfection after the ozone system. Of all the markets for ultraviolet processes, municipal wastewater disinfection is the largest and fastest growing segment. In order to protect public health and the environment it is imperative to disinfect sewage effluent after traditional biological purification. Wastewater is treated at central treatment plants and discharged into rivers, lakes, streams or oceans at one or only a few discharge points. The result is a disproportionate burden on the receiving waters flora and fauna, especially fish and shellfish beds. Undisinfected effluent can result in reduced, eliminated or contaminated fauna populations. It can also endanger human health through direct contact activities such as swimming or water sports and indirectly through the disruption of the ecosystem. Previously, chlorine disinfection was the preferred method for protecting the public health. Unfortunately, this does not protect the ecosystem due to the harmful addition of chlorine to the environment and the generation of byproducts as the chlorine reacts with wastewater constituents. UV, on the other hand, inactivates potentially harmful microorganisms without adding any chemicals to the wastewater (and therefore the environment). Driving the growth of this market is the addition of UV to previously undisinfected sewage effluents as well as the conversion of chlorine disinfection facilities to the safer and environmentally friendly UV alternative. Amalgam XPT UV lamps by Philips for Wedeco UV Systems are manufactured, tested and proven to be extremely reliable. Philips lamps are robust, operate in a wide temperature range, save energy, and are environmentally friendly because they contain very little mercury.